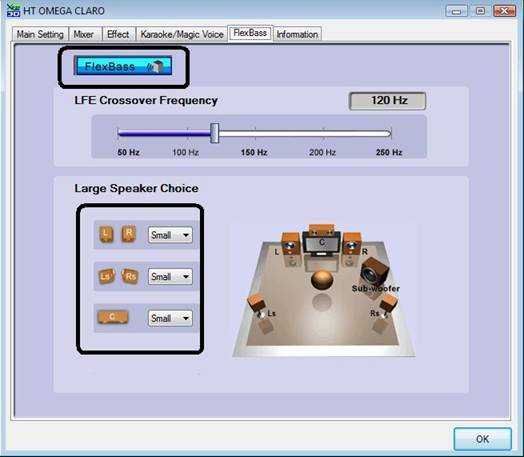 Claro series sound cards use DirectX for multichannel output. In some cases you may experience a slightly weaker subwoofer output. Claro series software includes FlexBass controls for bass enhancement and selecting crossover frequencies. The FlexBass panel gives users control over bass redirection. A slider is used for adjusting frequency cutoff as well as setting speaker size for each output unique to your speaker configuration. Activate FlexBass and set speaker size to Small (default value) to enhance subwoofer output and adjust Crossover Frequency. The effects are active on Dolby Digital Live and DTS:Interactive output.